Tzatziki sauce is so much more than just a dip for fresh vegetables, corn chips, or crispy falafel. Have you ever tried it as a spread for sandwiches or on veggie burgers (instead of mayo)? Or as a topping for grain salads? So good! This vegan tzatziki sauce is fresh, tangy, and has just a tiny bite from the garlic. 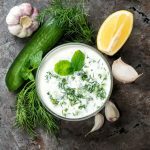 Tzatziki is a Greek yogurt-based sauce with cucumber, garlic, and fresh herbs that is also served as a thick dip. While it’s typical in Greece, it’s very popular in the neighboring countries as well. Growing up, I spent pretty much every summer in Croatia (my parents have a place there) and tzatziki was something I ate a lot of. Croatian tzatziki was enriched with walnuts and sometimes minced onions. It was usually served as a thick dip, but it wasn’t uncommon to encounter “cacik” – a variation of tzatziki with fresh mint, and served as a soup. So you can see how depending on which country (or even a region) you’re visiting, this dip/sauce/soup calls for some differences. The main ingredient in this vegan tzatziki sauce is plain coconut yogurt (or any unsweetened plant-based yogurt you like). I was worried about the coconut flavor being too overpowering in this recipe, but it was actually really good. And even my husband, who is a huge fan of Greek yogurt-based tzatziki, really enjoyed this vegan tzatziki. You will often see tzatziki recipes calling for straining plain yogurt overnight to make a thicker, richer base for the dip. So, if your yogurt isn’t thick enough you can strain it overnight in cheesecloth or use a 50/50 mixture of the thinner yogurt and sour cream. What if you don’t have access to plant-based yogurt (or don’t want to make it at home)? You can use soaked cashews or medium-firm tofu instead (the firmer the tofu, the thicker the tzatziki). The other key ingredient in any tzatziki sauce is a cucumber. I prefer English or Persian cucumbers rather than plump, regular (field) cucumbers. English and Persian cucumbers have a thin skin (no peeling required) and very little seeds (no seeding required). I always grate the cucumber, but it’s not uncommon to encounter cubed cucumber. I like a lot of garlic in my tzatziki; my husband does not. There are actually two types of tzatziki – hot and cool. Hot tzatziki contains a lot of garlic (a whole head of garlic for a kilo of yogurt), while cool tzatziki might have a just a clove or two. The biggest divergence of opinion where this simple recipe is concerned is on the subject of herbs: dill or mint? I prefer fresh dill but feel free to use whichever you prefer. While many recipes call for olive oil, I find the coconut yogurt creamy enough on its own. If you think that your tzatziki lacks richness, add one teaspoon of olive oil at a time. A splash of lemon juice (or vinegar), a pinch of sea salt, and that’s it! As I have already mention, you might need to strain the yogurt overnight if it’s not thick enough. All you need is a strainer, a bowl, and some cheesecloth. Fold the cheesecloth a few times so it forms several layers and lay it inside the strainer. Set the strainer over the bowl and pour the yogurt into the lined strainer. Let this sit in your fridge for anywhere from an hour to overnight, depending on how thick you want the yogurt. The same goes for the cucumber. Cucumbers are full of water, which is what makes them so refreshing. Unfortunately when mixed with acidic ingredients like yogurt and lemon juice, cucumbers start releasing moisture — making a once-creamy yogurt, well, watery. The trick for preventing this is to squeeze out as much water from the cucumber as possible before adding it to the yogurt. You can add a little bit of salt and let the cucumber sit for a few minutes, which will help bring out the cucumber juice. If you have time, prepare your tzatziki at least an hour before you plan on serving it. The flavor gets even better overnight. 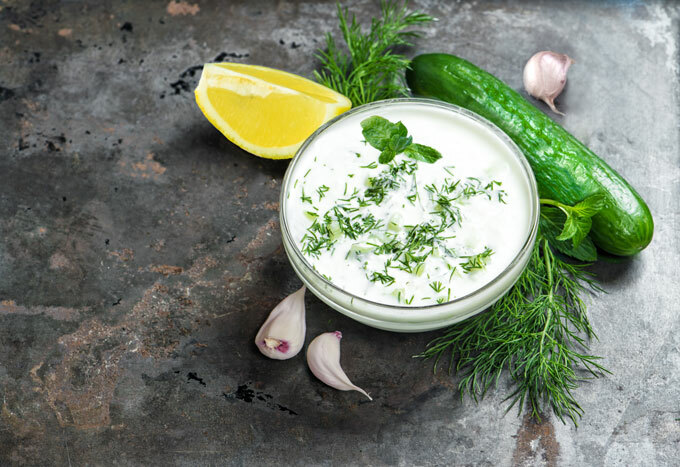 The longer the garlic and dill rest in the yogurt, the less sharp bite they have and the better the tzatziki tastes. 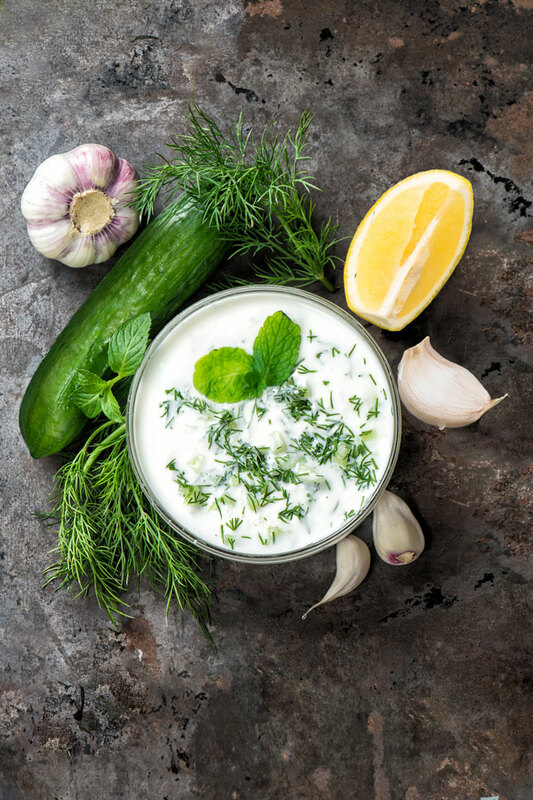 Tzatziki is a Greek yogurt-based sauce with cucumber, garlic, and fresh herbs that is also served as a thick dip. This vegan tzatziki sauce is fresh, tangy, and has just a tiny bite from the garlic. Add the finely grated cucumber with a large pinch of sea salt into a medium bowl. Let the cucumber sit for 10 minutes, then squeeze out any excess moisture. (You should end up with about 1/4 cup of cucumber). Add all the other ingredients and stir to combine. Store leftover tzatziki in an airtight container in the refrigerator for up to 5 days. *If you can't get English cucumber, try to find a Persian cucumber instead. A field cucumber can work in a pinch, but you will have to peel and seed it. **If your like thick tzatziki, strain the yogurt first. All you need is a strainer, a bowl, and some cheesecloth. Fold the cheesecloth a few times so it forms several layers and lay it inside the strainer. Set the strainer over the bowl. Pour the yogurt into the lined strainer. Let this sit in your fridge for anywhere from a half an hour to overnight, depending on how thick you want the yogurt. Tzatziki has always been one of my favorites, BUT, I don’t like it with dill at all. I usually leave that out and it’s scrumptious! I’m going to make this Petra! HAVE A HAPPY VALENTINES DAY! I am celebrating my 31st wedding anniversary as well, today. Hope you and Tanner have a great day! Hope you had a great Valentines Day, Kristi! And congratulations on your anniversary – what a perfect day to celebrate a wedding anniversary 🙂 Do you add any other herbs instead of dill or just leave the tzatziki without any herbs? I love dill, so I always add A LOT, lol. Usually just parsley for some extra nutrition/greens (as small a serving as it might be) :). I used to buy a delicious local brand of this sauce in my Kroger store but it has dairy, so I gave it up when I went to vegan/plant-based eating. That particular product did NOT have dill and so I got to where I really liked it that way. I am very excited to try your recipe. Have a wonderful weekend!!!! Thank you so much, Kristi! Parsley is a great idea! I add parsley to almost everything but never used it in tzatziki. So, thank you for the tip – I will definitely give that a try! I absolutely love this recipe! I used almond yoghurt as I could not find plain coconut yoghurt. Perfect balance of flavors and easy to put together. I made this to use as a dip but I feel that it would be fabulous as a salad dressing as well. Thank you so much for the feedback, Ida! ❤️ You’re definitely onto something with the salad dressing 🙂 I have a recipe for vegan ranch dressing (I will share that soon!) and it does have very similar ingredients! So happy you enjoyed the tzatziki! Once this is made, how long will it store for in the fridge? Getting ready to make this and your air fried falafel! yum yum! Great! And thanks for the reply! Have you ever made the falafel balls and either frozen them or refrigerated them to use at a later time? Yes! Just keep in mind that leftover falafel is never quite as good as fresh. I have all the instructions for storing leftover falafel above (in the recipe box under instructions point 4 🙂 Let me know if you have any more questions.